I make a lot of chicken (which don't get me wrong, I do love) but these enchiladas were a nice change. They were also very simple to make and were so so good! In a large ovenproof skillet, cook ground turkey and onion over medium heat until the meat is no longer pink; drain. Stir in the chili powder, cumin, garlic, water, and picante sauce. Simmer, uncovered, for 10 minutes. Stir in 1/2 of your shredded cheese. In a 13x9 baking dish arrange the tortillas and evenly spoon in your filling. Roll and place seam side down. Top with remaining cheese and enchilada sauce. Bake at 350° for 20-25 minutes or until heated through. Enjoy! I love enchiladas, but I hate the mess. I can make a mess in my kitchen for almost anything except a glass of tea. But these sound good and pretty simple to make. I would heat the tortillas in the micorwave and keep them warm so they don't crack while folding. Works better for me. That is a good idea. I occasionally have the corn tortillas crack and it's a pain. 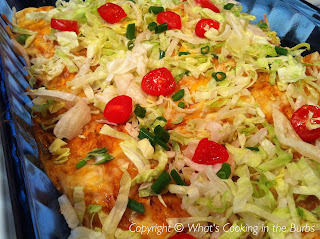 been dying to try out an enchilada recipe!! i typically stick with tacos and really need to broaden my mexican-cooking horizons! :) thanks so much for sharing this recipe, can't wait to try it out!